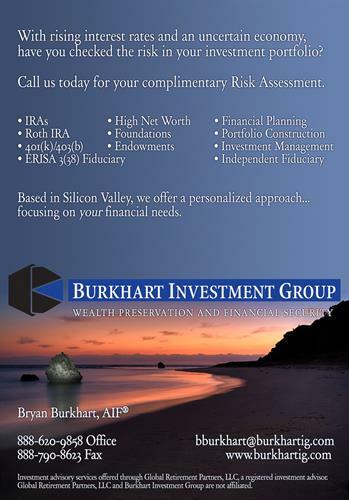 Burkhart Investment Group, Inc. specializes in serving as an Investment advisor along with offering Financial Management, Investment Portfolio Construction, Strategic Planning, Retirement Planning and ERISA 3(38) fiduciary services in the San Francisco Bay Area, San Jose and Morgan Hill. The Fiduciary Rule that was passed into law this year will affect all retirement plans and IRAs. By partnering with an ERISA 3(38) Fiduciary, you will be better prepared to meet the challenges in your financial and retirement planning. Our financial advisory practice will operate as a named fiduciary to 401k plans and serve as an Accredited Investment Fiduciary (AIF®) to institutional investors, IRA’s and taxable accounts. We look forward to serving all of your financial needs. Go to www.BurkhartIG.com for more information. Investment Advisory Services offered through Global Retirement Partners, LLC, a registered investment advisor and separate company from Burkhart Investment Group, Inc. Questions about the Fiduciary Rule?